I’m very happy with this little number, and super happy with how the beaded tassel turned out. The beads were gifts from various friends at our baby shower years ago, so it has special meaning. I’ve learned that the multi-colored round bead was made by our friend Steven. Still hoping to ID the others as friends see the photo and claim their bead. But it’s a bit longer than it was in that photo. Hopefully it will be finished soon and join the FO club! One of my favorite quick meal fall-backs is peanut sauce. 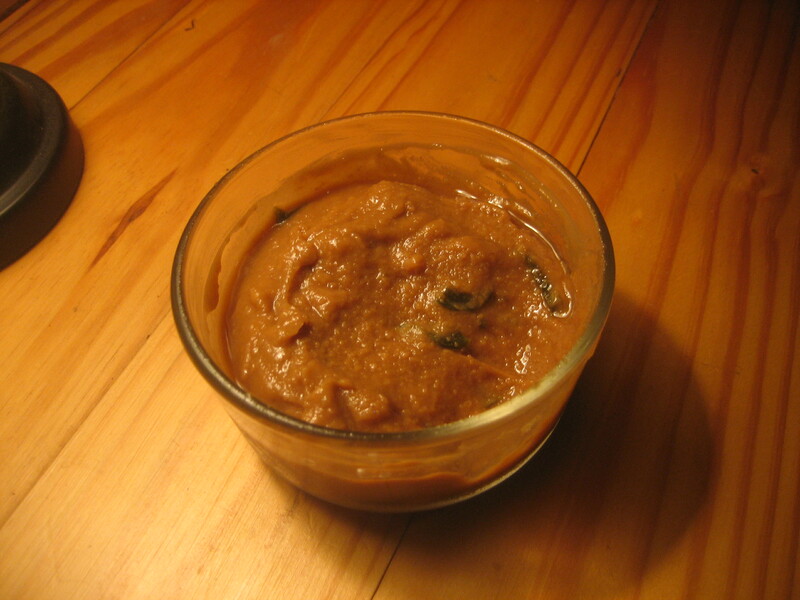 If I need to take something to a party, it’s likely to be a dish of peanut sauce and fresh crudite to dip. 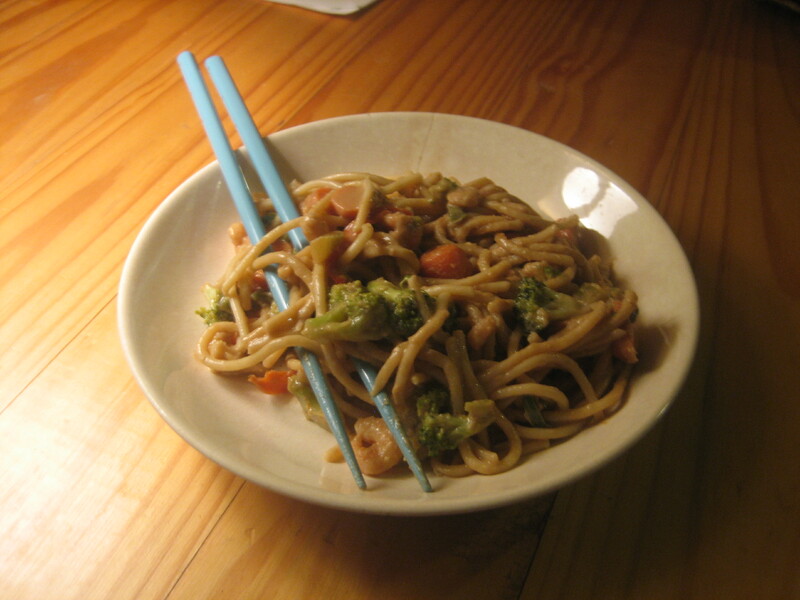 But I always make twice or four times as much sauce and use a potluck as an opportunity to stock the freezer with a quick dinner tool: stir fry some fresh vegetables, boil up some noodles, add some frozen shrimp or leftover cooked chicken and mix it all with the sauce. This yields about 2 cups sauce, enough to use for dipping one night and dinner another. Crush the garlic into a saucepan and add soy sauce, peanut butter, sugar and water. Start the mixture on low-medium heat. While the sauce is beginning to heat, seed the jalapenos and cut them into small slivers (Wear rubber gloves to protect against hot pepper injuries to your eyes or nose!). Add the slivered jalapeno to the sauce and bring the whole thing to a simmer, stirring to smooth it. Simmer about 5 minutes to heat and combine well. Remove from heat and let cool. If the sauce ends up too thin, cook it a little longer to thicken. If it’s too thick, thin it with a little hot water. Serve half the sauce with crudite for dipping. Freeze the remainder in 1-cup portions. Thawed sauce — see the slivers of jalapeno? When you want a quick dinner, thaw the frozen sauce and stir to smooth it. 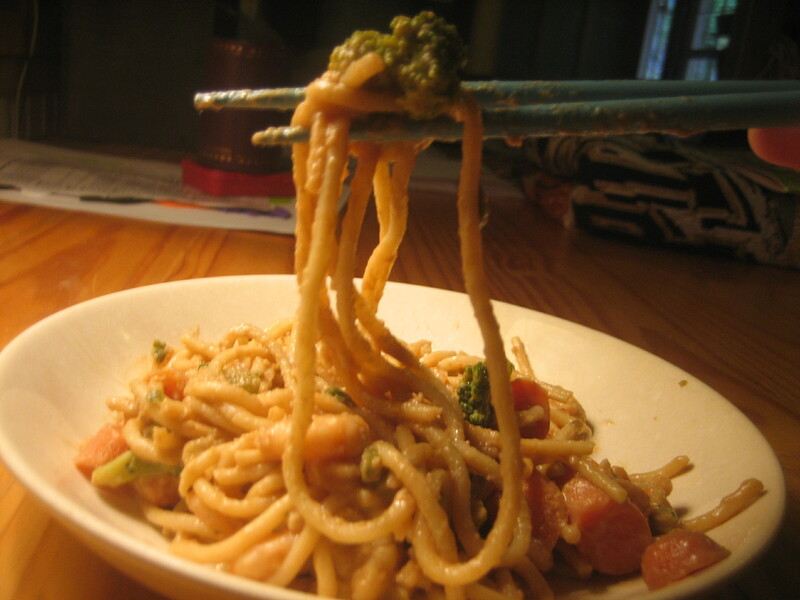 Stir fry any combination of fresh vegetables and boil some spaghetti, udon, linguine or other strand-shape pasta. Drain the pasta, reserving the water. When the vegetables are almost done, toss in some frozen shrimp or some cooked, leftover chicken or pork. Add the sauce and some of the pasta water to the pan of vegetables and stir to make a nice, coating sauce. Add the drained pasta, stir and serve. As for reading, all attempts to pick up a book and get serious about reading it have resulted in heavy eyelids — even at 11 in the morning! So I’m sticking with nice, easy, modular reading in The Week. I’ve said it before in an earlier Yarn Along, but here’s how I feel about this magazine: luff, loaf, lurv it! I think it looks a bit like a Dr. Seuss illustration on its own, but I do like it a lot when it’s all wrapped and fixed up around my neck. And it is a great warmer. The yarn is a mill end cotton that I picked up at Earth Guild in Asheville 4 years ago. (Love you, Earth Guild!) 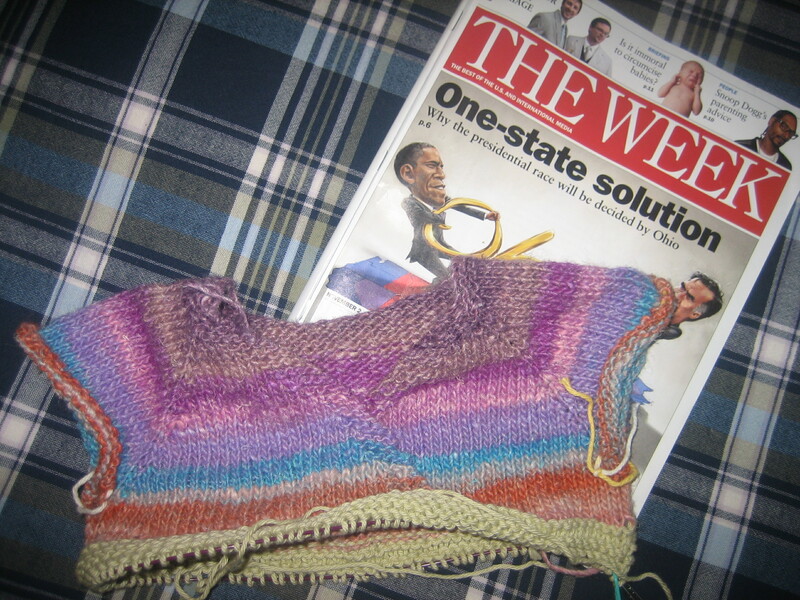 I bought 2 massive cones for a total of $16, and I’ve knitted 3 objects from it, with most of one cone still left. 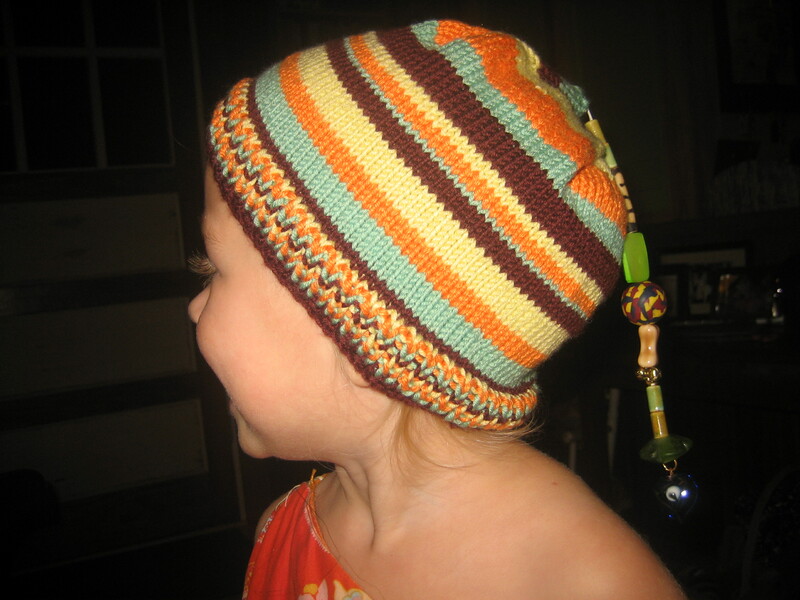 A slouchy hat to wear with the scarf will probably be next. Yuckity, yuck, yuck, yuck! This is the Sheer Poncho, blogged about here. 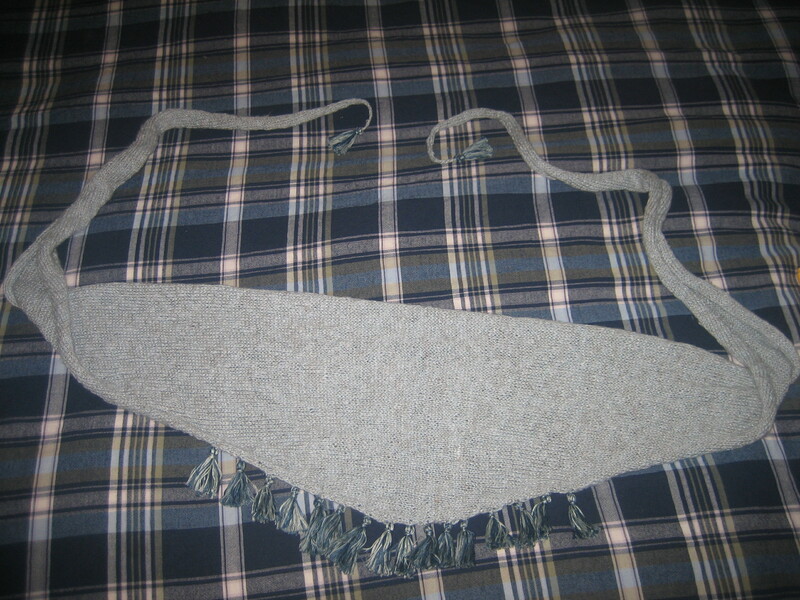 It is so tight, especially the bind off, even though I did the most elastic bind off I know. It feels like a straight jacket. It will soon be frogged, because I cannot stand to let that gorgeous Malabrigo yarn go unworn. That’ll teach me to knit projects that are created and modeled by tiny 20 year olds. 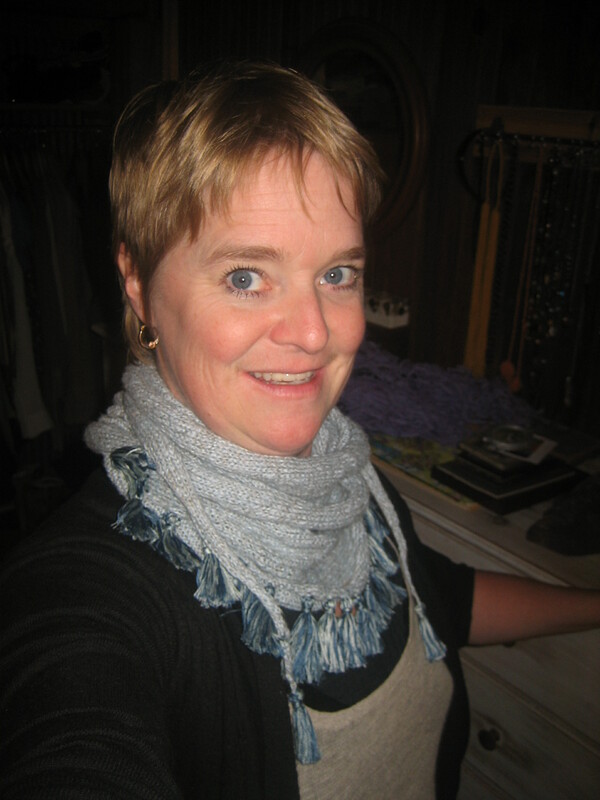 Good thing the tasseled scarf turned out so well—it helped ease the “I spent 3 months knitting this piece of *#@*” depression. Hopefully L’Oiseau’s Oriental Lily will continue my positive streak.